Is there a reasonable chance for a cure? for comfort? What is the current quality of life? Do I have the financial and emotional resources to handle long-term care? Is the relationship with my pet changing or decreasing? How many of my pet's physical activities are still possible? Is my pet suffering even though physical pain is not evident? How will I look back and remember my pet at the end? When your pet is suffering or has a severely diminished quality of life, and you have discussed all possible options for treatment with your veterinarian, you can make a decision knowing that you are doing what is best for your animal friend. If there are any questions you might have, don't hesitate to call us. At Star Prairie Veterinary Clinic, we will handle your pet's euthanasia procedure with dignity and compassion. You may want to spend some quiet moments alone with your pet in our private exam room. If you desire, or your pet seems anxious, a sedative can be administered beforehand. When you are ready, a special solution similar to a concentrated anesthestic drug will be injected into a vein. The drug causes a deep sleep after which the breathing and heart will stop. This usually occurs within 30 to 60 seconds, but can take slightly longer in some animals. 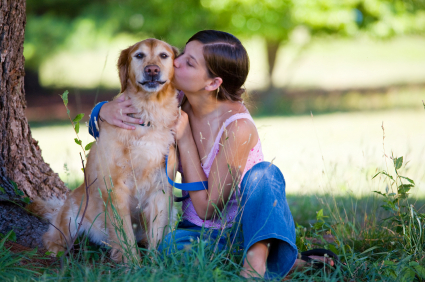 Your pet can sense your emotional state, so be present only if you are able to provide calm support. Some people realize that witnessing the procedure (especially for younger children) would be too distressing and decide not to be there. Our professionally trained staff is compassionate and caring under all circumstances. Star Prairie Veterinary Clinic. Copyright © 2015. All Rights Reserved.